I love coming across truly new innovations that make parenting a bit easier. Such is the case with the Baby & Me organic bamboo bath towel. An ideal gift for parents-to-be, this clever creation is sold in a set which includes a towel that mom or dad wears around his/her body like an apron, and a hooded baby-sized bath towel to wrap baby in after bathtime. This way, when you lift baby out of the tub, you can secure him against your body (without getting drenched yourself!) and then get him all warm and toasty in his own towel. Additionally, baby's towel may be buttoned to the apron worn by the parent, so there's no need to try to hold onto the towel while nestling baby in it. Here is a pictorial illustration of the Baby & Me bath towel in use, as well as a video demo. Additionally, the Baby & Me bath towel is eco-friendly and non-toxic, making it perfect for your little one's delicate and vulnerable skin. Made in the USA from 100% organic bamboo terry and 100% organic ribbed cotton trim -- bamboo is naturally anti-microbial and anti-bacterial -- and the set is packaged in FSC certified paper as well. Before this towel set came along, I was juggling my son on my knee while trying to precariously wrap him up. Now, I simply nestle him into my warm body while wearing the apron component of the Baby & Me set, and then I'm able to effortlessly cover his body with the hooded towel, which is amazingly soft and lovely. The mother/inventor behind Baby & Me is also researching children's hospitals and women's shelters that may benefit from the donation of these innovative towel sets, so in addition to this being a wonderful product, it is also one that will soon be charitable in nature. 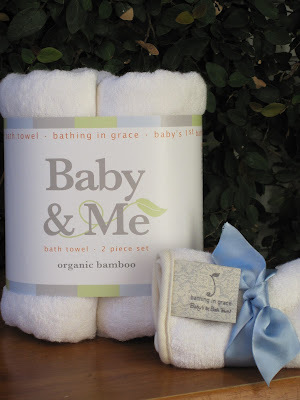 Purchase your Baby & Me towel set here.